Business users have always been able to make a case for digital data back-ups but, until recently, home users have rarely had to be concerned with data safety. After all, what could possibly be on a home computer that someone would absolutely need to store a copy elsewhere? With the home PC being ever increasingly integrated into our daily lives, a hard disk crash can mean the loss of precious photographs, personal financial data, correspondence and numerous other irreplaceable digital items. Also, broadband internet access allows for astonishing amounts of information to be collected over time by the home user, with much of it being "squirreled" away for viewing at a later date. But what makes it so difficult for the home user to back up all of this? While the quantity of data stored on hard disk has increased by several orders of magnitude over the last few years, efficient & cost-effective optical storage has increased by less than one order of magnitude. Magnetic tape, commonly used in businesses throughout the world, offers high storage capacity, though the backup process remains slow and retrieval can be problematic without automation; who draws the short straw to stand beside the drive feeding a new tape in after every read cycle? Wide acceptance & uptake of broadband has helped the flow of data, but has led to the need for multi-gigabyte storage, and broadband speeds and costs still make accessing very large quantities of data stored on remote servers an untenable proposition. An obvious solution is portable disk drives. Several manufacturers offer portable hard drive solutions, from stand-alone units to internal caddies and even simple IDE plugs that connect to a bare drive outside the PC case. 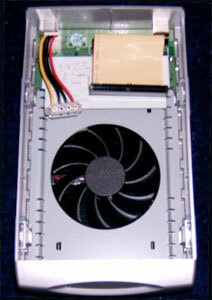 Both the latter solutions are less than adequate for truly portable storage: a bare drive is easily damaged and internal caddies require a caddy mount of the same design for each computer the drive will be used in. Stand-alone units are thus the best proposition for use as portable storage. 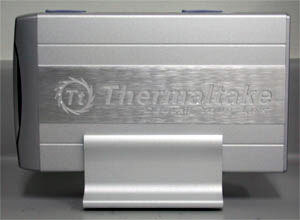 Thermaltake's offering is the SilverRiver, a stylish brushed aluminium and silver-painted plastic enclosure for 3.5" IDE drives. Access to the drive is via USB2.0 and, in some models, IEEE-1394 (firewire). 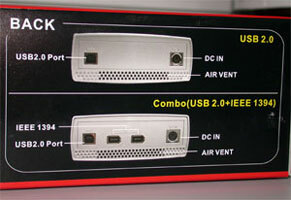 The firewire model actually has two IEEE-1394 ports to allow daisy-chaining multiple firewire devices, if so desired. 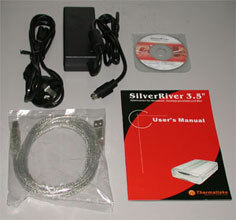 The complete package is a 3.5" HDD enclosure, a cradle, instruction booklet, Windows 98 driver mini-CD, shielded USB cable and power brick. The mains plug is a standard Australian 2-pin connector, while the power plug is a PS2 connector. Cooling the drive is a quiet, low-profile 80mm fan turning at 1500rpm, promising excellent cooling for today's fast but hot 7200rpm IDE drives. Heated air is exhausted through two grills front & rear. Even located within arm's reach, the fan is almost inaudible, though disk noise can be heard during access. However, the volume is no greater than that emanating from a sealed computer case. 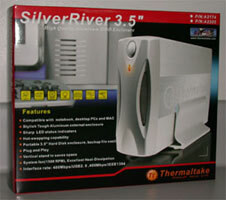 While not a silent device, most users will appreciate the SilverRiver's low noise qualities.